The weights of 6 students (in kg) are 14, 26, 28, 20, 35, 30. Find the median weight ? Median = Median is the middle-most observation of the data. In the present case N = 6, which is even . The runs scored by 9 players of a cricket team are 44, 31, 50, 40, 50, 70, 11, 80, 56 Find the median score ? 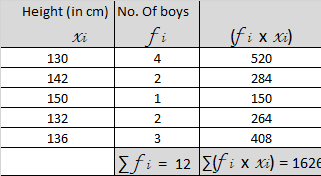 Given table shows the height of 12 boys . Find the mean Height ? If the mean of the given frequency distribution is 6 , find the value of p ? Mode = Mode is the value which occurs the most frequently. Since the number of boys of age group 15 is maximum . So, the modal age of boys is 15 . Find the mean and median for the given data, using empirical formula. Also calculate its mode ? Here , which is even. Hence, Median = 25 kg , Mean = 26.8 kg , Mode = 21.4 kg . Total number of terms = 39 , which is odd. Since, Cumulative frequency shows that 20 th student gets 22 marks . Find the median of odd numbers between 8 and 25 ? Mode of the given data is the value which occurs the most frequently. Since, 14 occurs maximum number of times.